"He became the best of all of us." It seems somewhat almost absurd that a man who has long been regarded as one of Britain's finest directors has finally been appropriately honoured on DVD not in the country in which he was born and exclusively worked, but in the USA. As I've seen pointed out elsewhere, this is only the second DVD box set released anywhere devoted to a British film-maker, the other being Alfred Hitchcock. You've heard of him, haven't you? Clarke's comparatively low-key fame stems in the main from his decision to work almost exclusively in television – he only made three films for the cinema and one of those was a remake of a TV film of his own that was banned by the very corporation that commissioned it in the first place. A veteran of over sixty dramas, Clarke's work was of a consistently high quality and in his later years he began pushing the boundaries of the medium in both content and form. It is these works for which he is largely remembered and which this excellent box set from Blue Underground has chosen to celebrate with such style. Handsomely packaged, the disks are laid out in chronological order, starting with the work that was to prove a turning point in the director's career. Scum was originally commissioned by the BBC and then banned by a new management not keen on the sort of risk-taking that was going to distinguish almost all of Clarke's subsequent work. This marked the abrupt end of a honeymoon period for the director at the BBC, during which he had been able to develop his own distinctive style, unhindered by those in power, many of whom until then had been openly supportive of his work. His experience with Scum changed all that, but it also saw a shift in Clarke's directorial style and a handling of violence – both physical and emotional – that was direct, brutally realistic and confrontational. Despite the repeated protestations of those involved, Scum remained a banned work and rather than live with the decision and move on, Clarke and writer Roy Minton chose to bring it to a wider audience by remaking it for the cinema. The feature version of Scum had the sort of impact that most UK film directors would die for now and to this day has left an indelible mark, adding its own take on the word 'daddy' to everyday language – just last year the film's star, Ray Winstone, appeared in commercial breaks to ask us what "the daddy" of crisp flavours is, and just recently Mark Steele, in one of his highly entertaining lectures for BBC Four on key historical figures, suggested that one of them (I cannot recall which – feel free to write and tell me) might have asked a rival in the heat of argument, "where's yer tool?" Having launched Ray Winstone and Phil Daniels on the road to future (British) stardom, Clarke struck gold again in Made in Britain with a bold, intelligent script by rising star David Leland and a brilliant central performance from a young newcomer named Tim Roth. The story of smart, articulate but aggressive skinhead named Trevor is sometimes uncomfortable but always compelling viewing, and the writing, acting, camerawork and direction are electrifying throughout, making this a crucial slice of British television history. Elephant was Clarke's penultimate film and was without doubt his most experimental and boldly realised work. A genuinely astonishing, minimalist look at sectarian violence in Northern Ireland, Elephant is structured as a series of long walking shots and wordless assassinations, connecting the audience in an almost intimate way to an act they are then forced to observe the consequences of when the camera settles for an uncomfortably long time on the bodies of the victims. There is no plot, virtually no dialogue and no music, and it's a bona-fide televisual masterpiece. Clarke's final film, The Firm, tackled the subject of organised football violence with a directness and intelligence that to this day leaves later takes on the subject such as I.D. 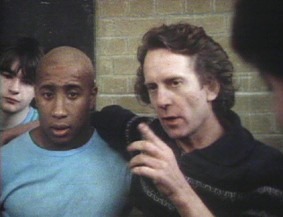 (co-incidentally directed by The Firm's Phil Davis) and The Football Factory standing, thanks in no small part to a very smart script, a keen awareness of the shifting financial and social status of the gangs themselves, a blistering central performance from Gary Oldman, John Ward's fluent Steadicam cinematography and Clarke's always bang-on direction. The violence in particular – from the domestic shouting matches to the full-on fist fights – is brilliantly handled. Blue Underground's box set is a dream come true for Clarke fans, bringing together four of the most important films made for British television and one of the best home-grown cinema releases of the past thirty years. Despite their low budgets and the fact that most were shot on high speed 16mm stock, the transfers are very strong, the soundtracks clear and the extras well targeted and of excellent quality. The Firm aside, all of the films have at least one commentary track and the information supplied by each is always informative and often entertaining. The collection itself has been assembled with loving care, as demonstrated by the handsome packaging and the often splendidly done menus, whose designs are always impressively film-specific, to the extent that each looks as if it was handled by a different designer (which it may well have been, of course), helping to give each DVD a very specific identity. Given a disc of its own is the BBC documentary Director: Alan Clarke, though this has to be seen more as an extra than one of the films of the set (and thus has not been reviewed seperately). Very straightforward and workmanlike in structure, this was produced by the BBC in 1991 to be shown alongside a number of Clarke's films (including the only screening to date on a main BBC channel of the original version of Scum) as a tribute to the director, who had died just a few months earlier. Presented and narrated by Made in Britain writer David Leland and shot by John Ward – whose steadicam photography graced The Firm and Elephant, as well as Kubrick's Full Metal Jacket and a considerable number of other prestige TV and cinema works – the film does provide a useful introduction to Clarke's work for newcomers and those only familiar with the later films, tracing as it does the director's career from the early days at the BBC. It includes interviews with a considerable number of Clarke's friends and colleagues, including Stephen Frears, David Leland, Margaret Matheson, Phil Daniels, Ray Winstone, Gary Oldman, Chris Menges and John Ward, all of whom have very positive memories of working with a man whose work they still greatly admire. 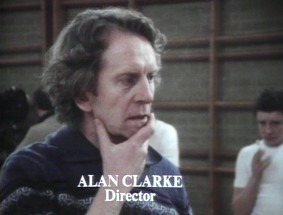 There are extracts from a number of Clarke's films, including some of the lesser seen ones, but the prize inclusion has to be footage of Clarke himself rehearsing and filming the murderball scene for the cinema version of Scum and the arguing against the BBC's banning of the original on The South Bank Show. Watch this after seeing all the films and listening to all of the commentaries and it is almost like meeting a god in human form. The picture quality is generally very good, though the included film extracts are less than perfect, the victim of the original transfer when the programme was first made. It's a slight shame that the Channel Four documentary Alan Clarke: His Own Man, which though similar in content includes interviews with Clarke's daughter Molly and a particularly interesting one with Gary Oldman, was not also included, though extracts of it appear on the Elephant disk. Also included is a Biography of Alan Clarke, a reasonably detailed textual extra with accompanying photographs. Blue Underground initially released The Alan Clarke Collection as a limited edition box set, the run restricted to just 10,000 copies. Whether they stick to that only time will tell, but if I were you I'd take no chances and get your copy now. Despite the claim on the box that this is a region 1 release, it is in fact region free, so as long as you can play NTSC disks on your system then regional coding should present no problems. I am not old enough to have grown up with Clarke's work from his early days, but do very distinctly remember seeing To Encourage the Others and being gripped and ultimately shaken by it, though it was to be a few years before I realised that the man who directed this was also the man who prompted a similar reaction in me in the cinema when I first saw Scum. Since then I have been an ardent fan of Clarke's work and like others find it almost perverse that although he was always highly thought of within the industry, his work was only to be really celebrated after he died. For me, Elephant remains a brilliant peak of a career that was tragically cut short just two years later, and I cannot help wondering just what Clarke would have achieved in the years following that had he lived and been allowed to continue experimenting with a form that has in recent times become all too predictable and formulaic. Clarke was one of the finest directors this country ever produced and this magnificent box set really does him justice, and frankly leaves just about every other DVD release this year standing. There's only one way Blue Underground could really follow this – a second Clarke box set containing Road, Christine, Pender's Fen, To Encourage the Others, Baal and Contact. No pressure, guys. For now, though, this will do very nicely indeed. Just excellent. I have quoted a couple of times in this review set from Richard Kelly's book Alan Clarke, published in the UK by Faber and Faber, and for anyone interested at all in Clarke's work and his career I cannot recommend it highly enough. Made up largely of interviews with close friends and colleagues, it covers similar ground to the documentary Director: Alan Clarke, but in far, far more detail, with entire chapters devoted to most of his key films. It's a consistently fascinating and entertaining read and is crammed with wonderful anecdotes about Clarke's working methods, drinking habits and sometimes complete disregard for authority. If you are buying this box set, consider this an essential extra. Blue Underground's Alan Clarke Collection contains the following films. Click on a title to read the review for that film.